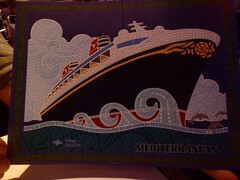 The Mediterranean Menu is another one that is the same in all restaurants that night. Appetizer – Mik tried the Tapas, Taste of the Mediterranean for the appetizer, but did not particularly like it. 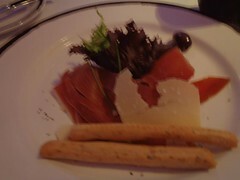 It comes with proscuitto, sun dried tomatoes, marinated olives, and parmesan cheese with grissini stick (this was the one thing he liked). Soup – Mik had the Spicy Andalusian Tomato Soup. 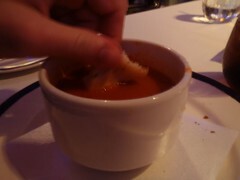 It certainly was spicy, but he enjoyed dipping the table bread in the soup (foccacia and rolls, not the pumpernickel that came with the soup). 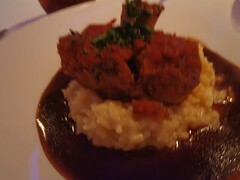 Entrée – Mik had the Braised Center Cut Osso Bucco “Milanese” and really enjoyed it. He also like the risotto that it was served on top of. 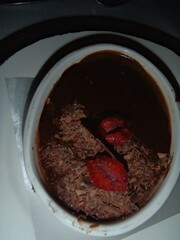 Dessert – Mik was full from all the bread and Osso Bucco, so he almost skipped dessert. He did end up trying the Chocolate Custard, though, and really enjoyed it.